Makoto Nakura is a musician whose artistry and astonishing virtuosity have been mesmerizing audiences over a quarter century. He creates innovative programs of new music as well as traditional classical repertoire, revealing the versatility and expressive range of the marimba while enlightening and entertaining the listener. His recent premieres include Toshio Mashima’s marimba concerto at the famed Philharmonie Hall in Berlin as well as Benjamin C. S. Boyle’s marimba concerto with the Montreal Chamber Orchestra. In 1994, Makoto moved from his native Japan to New York City, becoming the first marimbist to win First Prize in the prestigious Young Concert Artists International Auditions. His critically acclaimed performances around the world have included venues in London, Paris, Berlin, Tokyo, Hong Kong, Seoul, Montreal, Mexico City, Sao Paulo and Buenos Aires. In the U.S., he has performed for audiences in 41 of the 50 states with orchestras such as the New York Chamber Symphony, the Chicago Sinfonietta and the Los Angeles Chamber Orchestra. As a recital soloist, his long list of appearances includes Carnegie’s Weill Recital Hall, New York’s 92nd Street Y andWashington’s Kennedy Center. In addition, Mr. Nakura has been a guest artist with the Chamber Music Society of Lincoln Center and appeared in the Bravo! Vail Valley Music Festival, Spoleto USA Festival, Bridgehampton Chamber Music Festival and River to River Festival. He has also been developing collaborative works with other art forms.With the American Ballet Theatre, he has performed on numerous occasions in New York City, including appearances at the Metropolitan Opera House and at City Center, where he was soloist in a production of "Marimba". With the spoken word, he premiered “The Ocean Calls” based on poems by Pablo Neruda. With story-telling image projection, he created “The Story of Aoyagi” which is a Japanese ghost story.He produced a concert called “The Encounter of Art and Music” with the Hyogo Prefectural Art Museum in Japan; he played pieces inspired by Paul Klee, Jackson Pollock, and Wilem De Kooning with projections of their paintings. Since he launched “Forest Trilogy”, a project with choir, he has performed it in New York City, the U.K. and Japan.Based on a Japanese venerable essay, he most recently produced “The Pillow Book Project” with a narrator. Mr. Nakura has established himself as a dedicated champion of the music of our time. Many leading composers such as Carlos Sanchez-Gutierrez, Pierre Jalbert, Kevin Puts, Kenji Bunch, Michael Torke, David Schober, Jason Eckardtand Benjamin C.S. Boyle have written pieces especially for him. This marimbist’s mission is to explore and expand the possibilities of the instrument, demonstrate what an exciting and provocative vehicle it offers to composers and provide a thrilling experience for audiences. Born in Kobe, Japan, Mr. Nakura began to play the marimba at the age of eight. He earned Bachelor’s and Master’s degrees from Musashino College in Tokyo. He continued his studies at the Royal Academy of Music in London from which he was named an Asscociate.Indeed, because of his strong commitment to reaching younger audiences, he conducts many master classes and workshops at schools such as the Eastman School of Music, the Royal Academy of Music, and the Hong Kong Academy for the Performing Arts, among many others. 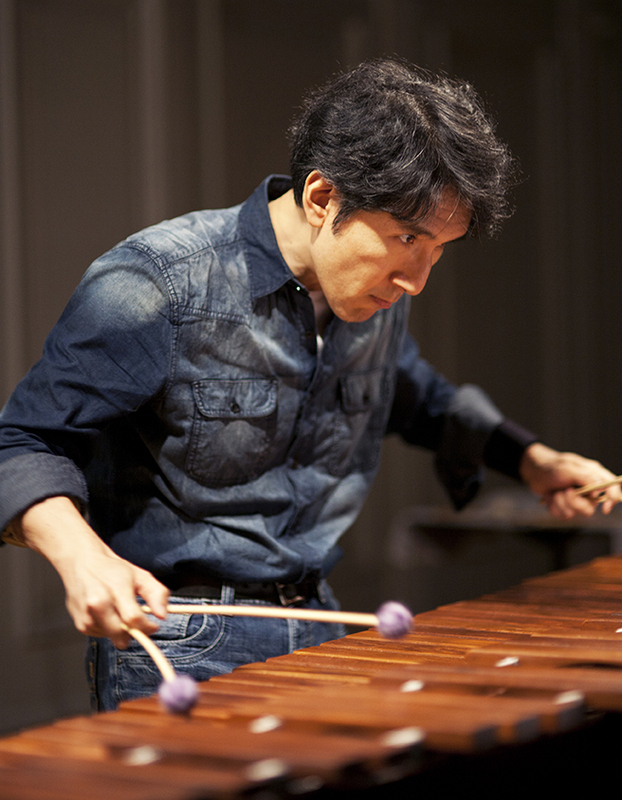 His recent honors include a National Arts Festival New Artist Award from the Japanese Agency of Cultural Affairs and the BMI/Carlos Surinach Fund Marimba Commission.His CDs “Ritual Protocol”, “Triple Jump”, “Tsuneya Tanabe Marimba Works”, and “Wood and Forest” are devoted to works written for him. He also recorded his own transcription of works by Bach called “Bach Beat” and most recently “Bach Beat II”, which was released by Naxos in April, 2016. A network television portrait of Mr. Nakura was broadcast across the U.S. on CBS Sunday Morning. His recitals have been widely televised and played on many radio stations.